A present for adventurous cooks and connoisseurs, to treat yourself or someone special. The Peugeot spice presentation box is an invitation to the sensory exploration of the cuisines of the world. The richness of spices lies in their diversity of aromas, textures, taste, uses and origins. They invite us to explore, be curious, while taking us on an adventure. 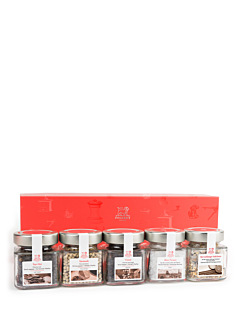 That's why the exclusive spice presentation box, specially selected by Peugeot, offers a variety of aromas and origins from around the world. The Peugeot spice presentation box is the ideal gift for celebrations and special occasions, offering the chance to enjoy flavours from the four corners of the world. Although spices are easy to use, they transform all kinds of dishes, from the simplest to the most sophisticated, enlivening them with finesse and subtlety, opening the door to the cuisines of the world and treating the palate to new, previously unknown taste sensations.